Halloween fans, get excited! 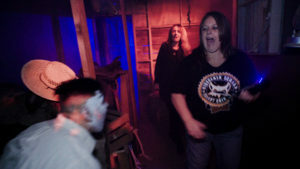 Saga Studios, LLC has released the teaser for their first feature-length film, a documentary called Epic Home Haunts. The fascinating film follows four groups of haunters as they create and build some of the world’s most incredible haunted attractions at their homes in Southern California, and Theme Park Adventure has your first peek! Those familiar with SoCal haunters know what they’re capable of – full-blown haunted attractions complete with giant animatronic dragons, Medieval castles, Old West cemeteries, and portals to other dimensions that rival the quality of haunts found at major theme parks across the nation.